Thanks to the contributions of partners like you, hundreds of people are benefiting from unique and innovative programs. The winter issue of the prestigious Stanford Social Innovation Review and the February issue of the Federal Reserve Bank’s Community Development Investment Review both highlight Mercy Housing Lakefront’s leadership. 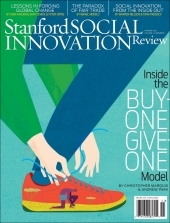 The winter issue of the prestigious Stanford Social Innovation Review highlights Mercy Housing Lakefront’s leadership in creating a social purpose real estate investment trust, or REIT, that was used to save 128 affordable rental homes in Aurora, Illinois. Mercy Housing Lakefront collaborated with the Housing Partnership Network and twelve other community development organizations to create the Housing Partnership Equity Trust REIT. The REIT was launched with an investment of $100 million from Citi, Morgan Stanley, Prudential Financial, Inc., the John D. and Catherine T. MacArthur Foundation and the Ford Foundation. Thanks to the partners, investors, and donors who sustain the work, Mercy Housing Lakefront utilized the REIT to save 128 affordable rental homes in Aurora, Illinois. This was the first transaction made utilizing the REIT. This innovative financial tool enabled Mercy to move quickly and efficiently to acquire the property without using traditional government or competitive process Low-income housing Tax Credit sources. Mercy Housing’s innovative foreclosure responses are featured in the February 2014 issue of the Community Development Investment Review, “Innovations in Neighborhood Stabilization: Responses to the Foreclosure Crisis,” published by the Federal Reserve Bank of San Francisco. This issue highlights achievements made by high performing nonprofits participating in the Citi Foundation and Housing Partnership Network’s Neighborhood Stabilization Initiative. Two innovative foreclosure responses pioneered in Chicago by Mercy Housing are featured. 180o Properties is an innovative social enterprise created by Mercy Housing Lakefront in partnership with The Cara Program to train and employ disadvantaged job seekers to secure and maintain foreclosed homes. Thanks to Founding Funder JPMorgan Chase Foundation, Citi Foundation, Housing Partnership Network, John D. and Catherine T. MacArthur Foundation, Enterprise Community Partners, Wells Fargo, Deutsche Bank, U.S. Bank, Bank of America, Boeing Company, Lloyd A. Fry Foundation, Helen Bader Foundation, Greater Milwaukee Foundation, and other supporters, 180o Properties has helped to protect over 10,000 vacant homes in Indiana, Illinois, and Wisconsin. The Mortgage Resolution Fund was created in partnership with Enterprise Community Partners, National Community Stabilization Trust, Housing Partnership Network, Illinois Housing Development Authority, and Neighborhood Housing Services of Chicago to help families save their homes from foreclosure. This program purchases the mortgage, not the home, and works with the family to make the new mortgage more affordable and assists the family with financial counseling, keeping the family in the home. To date, the Mortgage Resolution Fund has acquired over 1,200 mortgage notes in Illinois and Ohio. In addition to 180o Properties and the Mortgage Resolution Fund, the Community Development Investment Review highlights other innovative programs from around the country that were strengthened and supported through the Citi Foundation and Housing Partnership Network’s national Neighborhood Stabilization and Foreclosure Prevention Initiative.